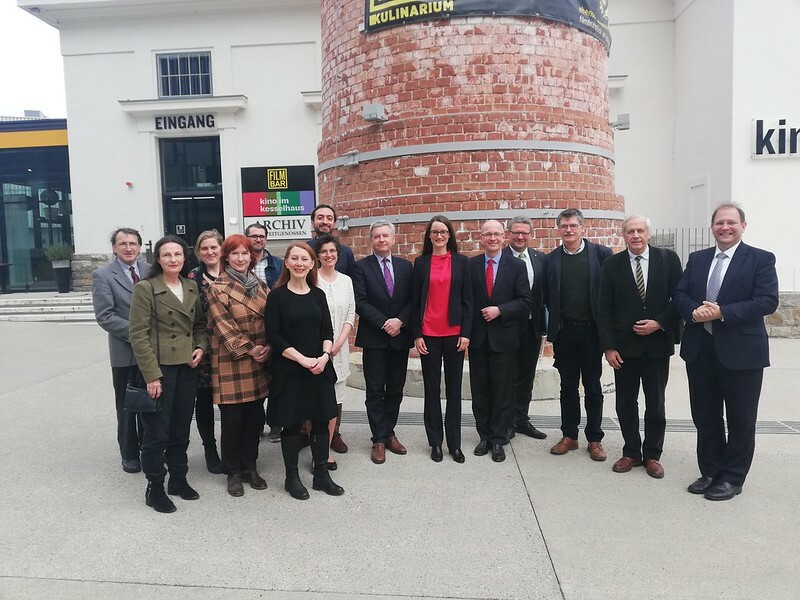 On 25 March 2019 a high delegation from Europa Nostra visited the European Heritage Awards / Europa Nostra Awards Archive at Danube University Krems in Austria. Krems is one of the best preserved old towns in Austria, located in the UNESCO World Heritage Wachau Cultural Landscape, 80 km from Vienna. They were welcomed by Friedrich Faulhammer, Rector of the University, Hermann Dikowitsch, Head of Department of Art and Culture of the office of the Provincial Government of Lower Austria, as well as Dr. Christian Hanus, the Dean of the Faculty of Education, Arts and Architecture and Head of the Department for Building and Environment and his colleagues Elisabetta Meneghini, Peter Strasser, Johannes Josef Koth, Patricia Engel and Anna Maria Kaiser. They presented the work carried out since 2012 thanks to the support of the Federal Chancellery and the Office of the Provincial Government of Lower Austria. The Europa Nostra delegation consisted of the jury chairs Koen van Balen (Conservation), Etienne Poncelet (Research), Laurent Lévi-Strauss (Dedicated Service), Goranka Horjan (Education, Training and Awareness-raising) and Board member, Graham Bell, the coordinator of the Awards scheme, Elena Bianchi and the coordinator of the Awards website, Giuseppe Simone. The archive of the European Heritage Awards / Europa Nostra Awards contains some 6,000 dossiers, 1,400 of which are award winners. It includes the Europa Nostra Awards, started in 1978 that in 2002 became the European Union Prize for Cultural Heritage / Europa Nostra Awards. The dossiers are stored in acid free boxes in a controlled environment in the library of the university and can be accessed by the public upon appointment. 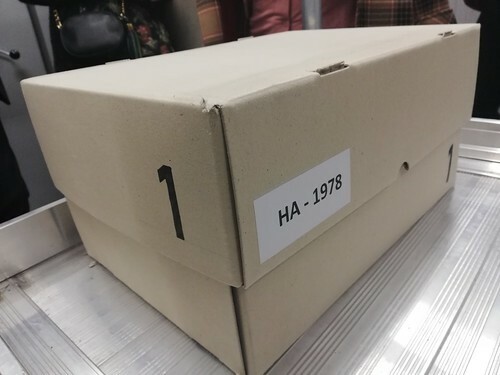 Christoph Hanus and Elisabetta Meneghini, who are in charge of the archive, revealed box number 1, containing the first entry forms dating back to 1978. Patricia Engel from the European Research Centre for Book and Paper Conservation – Restoration, explained the 3 main threats to written heritage, namely micro organisms, ink corrosion and acidic paper. The entry forms from 1978 stored in an acid free box. All entry forms of the award winners are digitised with a high resolution colour scanner that can process sizes up to the A2 format. Digital copies are catalogued and indexed and entry pages are uploaded on an online database. The selected archiving software AUGIAS-Express 6 presents descriptions, photos and jury citations, with an interface in English and German. The entry forms are stored on a secure server and can be consulted upon request. An interactive game has also been developed for school children visiting the archive. During the presentation, Robert Roithmayr, an architect, civil engineer and university lecturer who developed a software database called Formfinder, showed some new ways that the online experience could be enhanced.